Given the usual pedestal upon which mothers were placed by MGM head Louis Mayer, it's all the more amazing that Mayer gave the go-ahead for Another Language. Louise Closser Hale plays a domineering matriarch who controls the lives of her grown, married sons, using a fabricated heart condition to keep them in line. 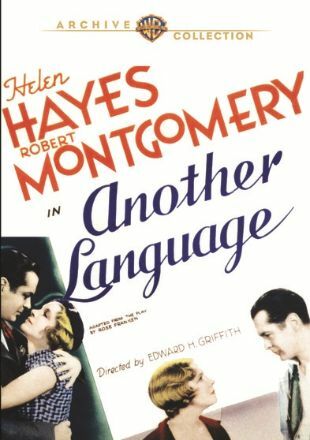 Helen Hayes marries youngest son Robert Montgomery, only to sit by in mute horror as Mother exerts her authority over her timorous offspring at a weekly family get-together. At the end, only Hayes and Montgomery's nephew John Beal have the courage to break the apron strings, but not without the formidable opposition of Monster Mom. Based on the Broadway play by Rose Franken, Another Language represented the screen debut of Margaret Hamilton, recreating the supporting role she'd played on stage.